In the combined anteversion (CA) technique for total hip arthroplasty (THA) with a cementless stem, cup anteversion is strongly influenced by the native femoral anteversion. It is hypothesized that in cases with large native femoral anteversion, cup anteversion can be decreased, and anterior cup protrusion from the anterior edge of the acetabulum could occur due to the achievement of optimal CA. In this study, the accuracy of CA in THA with the CA technique using imageless navigation and the relationship between the protrusion of the anterior edge of cup and optimum CA was retrospectively evaluated. 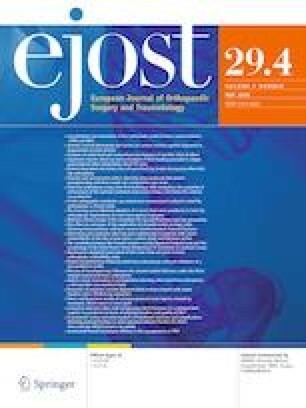 Ninety-seven patients (104 hips) who underwent primary THA by the CA technique using image-free navigation were enrolled in the study. The femoral stem was placed following the individual femoral anteversion so that the target cup anteversion could be determined following a mathematical formula (37 = femoral stem anteversion × 0.7 + cup anteversion). Results The resulting CA values effectively achieved accurate CA with 39.49 ± 5.03° postoperatively. On the other hand, anterior cup protrusion was measured by computed tomography image. A cup protrusion length of more than 3 mm was indicated for 60 cases (57.7%). All included patients were divided into two groups: Group 1 as protrusion positive and Group 2 as protrusion negative. In Group 1, preoperative femoral anteversion and postoperative stem anteversion were significantly higher, while postoperative cup anteversion was significantly lower. However, the postoperative CA value indicated no significant difference between the groups. The CA (stem-first) technique with image-free navigated THA could effectively achieve accurate CA. On the other hand, a large number of cases revealed anterior cup protrusion due to the low cup anteversion.